There are many Acronyms used for BIG BROTHER reality TV show. If your new to the game or to onlinebigbrother live feed updates this list of acronyms should be able to help you understand what the hell we are talking about. The most used acronyms are HOH, POV, DPOV, and DR. Theres also a collection of Big Brother terms these are defined in the BIG BROTHER Glossary Pages. Everyweek all the players except for the previous HOH compete in the HOH competition. The winner of that competition is awarded the title of Big Brother Head of Household for the duration of 1 week. Duties – The HOH are to select 2 players in the Big Brother House that will be eligiable for eviction from the game. In the case that one of the nominated houseguests is saved with the Power of Veto (POV) the HOH must select a replacement nominee. For the purpose of blogging and promotion the HOH is given the duty to take photographs from around the BB house featuring the other Big Brother Houseguests. Each HOH is given a couple hours to Blog about their reign as Head of Household and to send out some tweets. Benefits – Primary benefit is that the player who wins HOH is safe from elimination for 1 week as well as having the opportunity to evict one competitor in the game. The Head of Household gets to sleep in the HOH bedroom which brings its own advantages. a) door can be locked giving you privacy from other houseguests b) has a TV with closed circuit cameras around the house letting the HOH Spy on the other houseguests c) Each HOH winner is given a basket of treats, this can contain, candy, article of clothing, food, alcohol and a music CD. Negatives – HOH in seasons pass run the risk of isolating themselves from the house spending too much time locked up in the HOH bedroom. Sometimes the added power a houseguest gains from winning HOH can go to their heads this can breed contempt with the other players and finally the nominations alone will usually gain the Head of Household a couple enemies. Once the players have been nominated by the HOH for eviction they are given a chance to compete in a competition to save themselves. 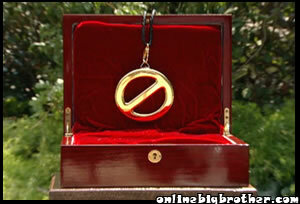 The winner of the Power of Veto Competition is awarded the POV granting them the power to remove one person from the nominations. There is only 6 player who compete in the POV so early in the Big Brother Game the players are automatically the HOH and the 2 nominees. These 3 players get to pick names out of a sack to choose who the other three POV players are. Special Case 1) If the POV holder uses the POV on a nominee they themselves are not eligible to be selected as a replacement nominee by the Head of Household. Special Case 2) If the POV holder is one of the nominees and they decide for some stupid reason not to use it to remove themselves the nominations they are still elligable for eviction. This happened during season 3 when Marcellas chose not to use the veto on himself and he went home. The Diary Room (commonly miss spelled dairy room) is where productions gets to talk to the houseguests. It is a major source of stock footage for the CBS television broadcast and allows CBS to try and get the players thinking in terms of strategy. It is sometimes hinted by the players that production attempts to sway what the players will do in order to increase Drama or keep certain players in the BIG BROTHER house. The Diary room is also where the players can go if they need to talk to production about games rules or if there is a need to seek medical attention. Hosueguests are prohibited to speak about their Diary Room sessions to other houseguests, it is a common thing to hear production getting angry at the players when they mention their DR talks. Jason, Alex & Paul discuss possible DE, maybe throw to Josh. What does the DE mean?